Films are an important source of entertainment in the Middle East, and Arab nationals are increasingly watching films via multiple channels, including on TV, online, and in the cinema. As in 2014 and 2016, nearly all nationals watch films on TV (91% in 2014, 90% in 2016, 90% in 2018). Since 2014, though, film viewing on the internet increased by 21 percentage points (42% in 2014 vs. 50% in 2016 vs. 63% in 2018), and cinema attendance increased by 9 points (33% in 2014 vs. 36% in 2016 vs. 42%% in 2018). 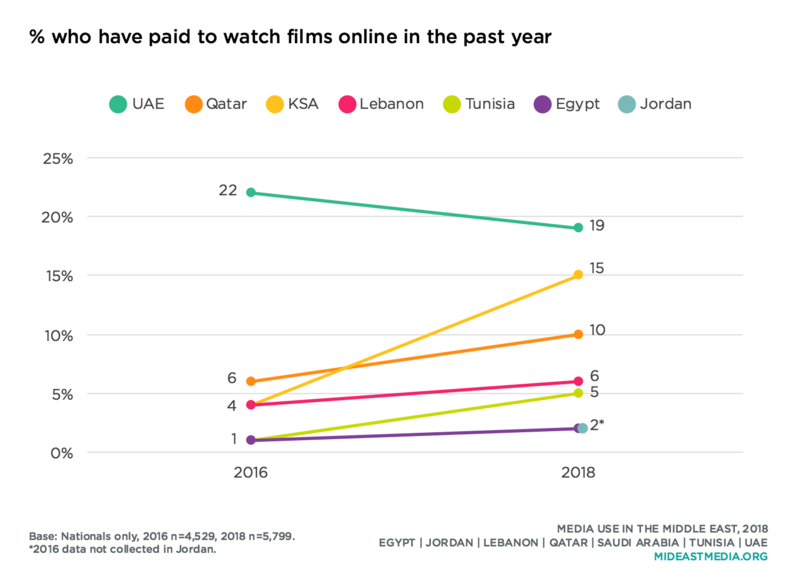 An increase in online viewing and cinema attendance was observed in all surveyed countries, except in Egypt where film viewership online remained stable since 2014 and cinema attendance decreased. Cinema attendance is particularly high in the UAE and Qatar, as more than half of Emiratis and Qataris go to the cinema at least once a month (59% and 55%, respectively). Now that cinemas have reopened in Saudi Arabia, four in 10 Saudis say they go to the cinema and three-quarters are likely to do so in future. Nationals in Jordan and Egypt report the lowest cinema attendance. Men and women are equally likely to attend the cinema (38% men, 34% women), and nationals of all ages attend the cinema in similar proportions, apart from those 45 and older who are less inclined to attend (45% 18-24 year-olds, 42% 25-34 year-olds, 36% 35-44 year-olds vs. 21% 45+ year-olds). Education seems strongly and positively associated with moviegoing (13% primary or less, 23% intermediate, 38% secondary, 52% university or higher). The platforms used watch films have changed since 2016. In most countries, nationals were less likely in 2018 than 2016 to say they watched films on a TV in the past six months, and more likely to have watched on a phone. Television, though, is still the dominant medium for watching films in all countries except Qatar, where more Qataris watch films online than on TV. Only about one in five of Arab nationals watched films on their phones in the past six months, but this represents a double-digit increase from 2016. While nationals of all ages watched films on a TV set in the past six months, younger nationals are three times as likely as those 45 and older to watch films online or on a phone (online: 52% 18-24 year-olds, 44% 25-34 year-olds, 31% 35-44 year-olds; 16% 45+ year-olds; phone: 31%, 23%, 17%, 10%). The languages in which Arab nationals watch films have changed little. Arabic remains the dominant language for films, with more than eight in 10 nationals watching films in that language. About four in 10 nationals also watch in English. 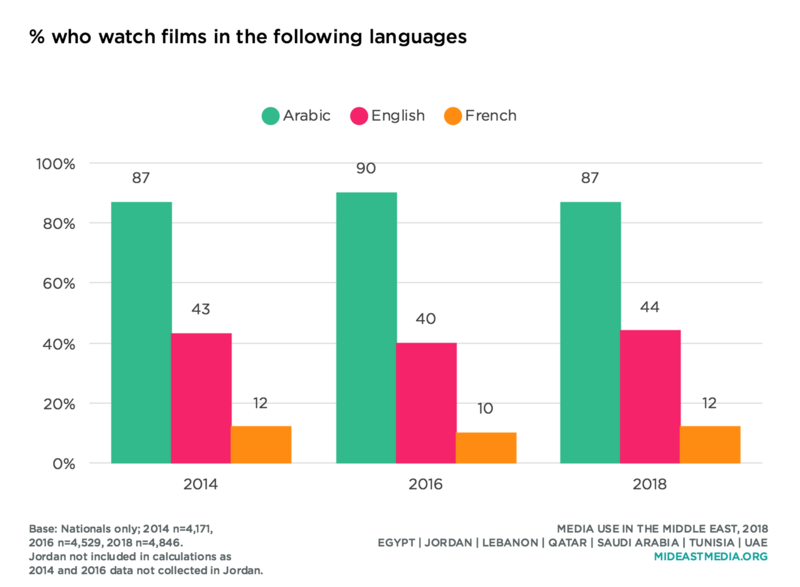 Most nationals in Lebanon, UAE, and Qatar watch films in English (67%, 67% and 57%, respectively), while about one-third of Saudis, Jordanians, Egyptians, and Tunisians do so (39%, 33%, 32% and 29%, respectively). 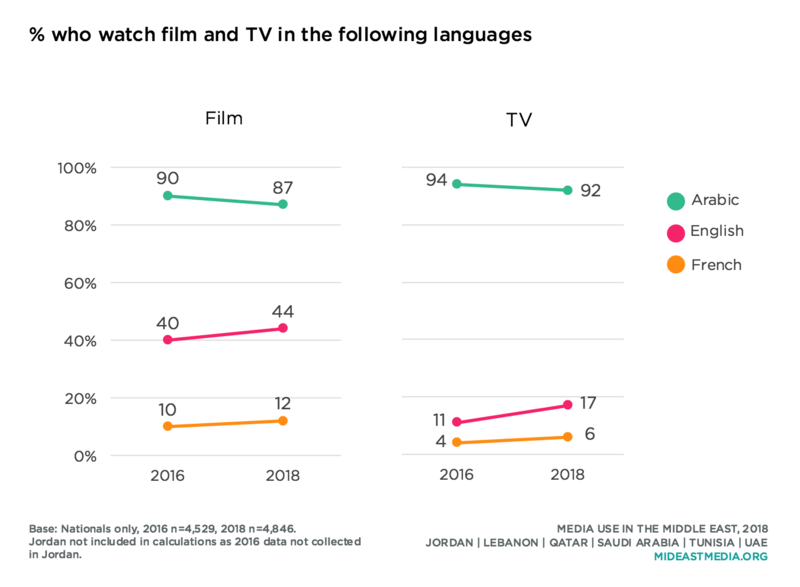 Nearly all nationals watch both films and TV in Arabic, but they are twice as likely to watch films in English as TV in English.In fact, nationals are far more likely to watch films in English than to watch TV, listen to music or podcasts, or use the internet in English. Interest in English-language films varies by key demographics. Men are much more likely than women to watch films in English (48% vs. 36%). The youngest age cohort is more than twice as likely to watch films in English as the oldest cohort (58% 18-24 year-olds, 47% 25-34 year-olds, 39% 35-44 year-olds, 23% 45+ years old). And the most educated nationals are more than nine times as likely as the least educated to watch in English (58% university or higher, 46% secondary, 27% intermediate, 6% primary or less). 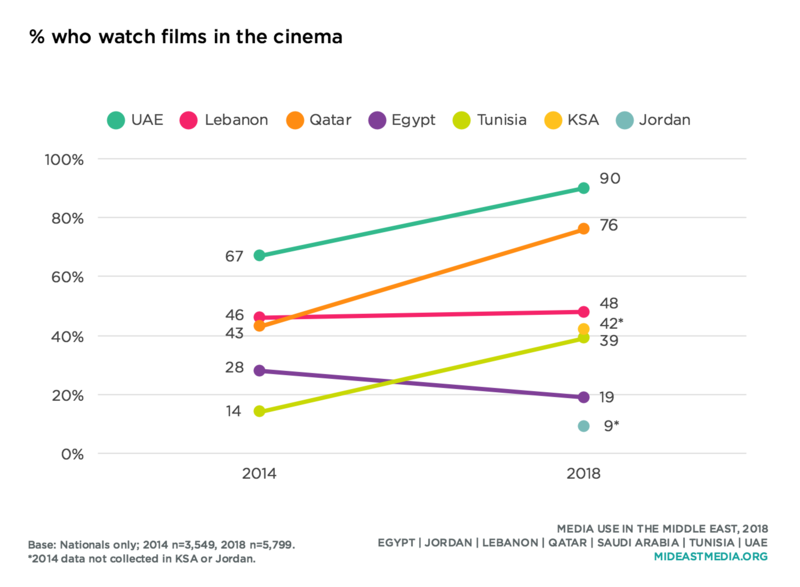 Most nationals in Lebanon, Saudi Arabia, Tunisia, and the UAE watch films produced in their own country, but only a quarter of Jordanians and Qataris watch films from their country. In fact, Jordanians and Qataris are twice as likely to watch films from other Arab countries than from their own country. Interest in films from the U.S. varies widely across countries. Most nationals in Lebanon, Qatar, and UAE watch films from the U.S., while fewer in other countries do so. 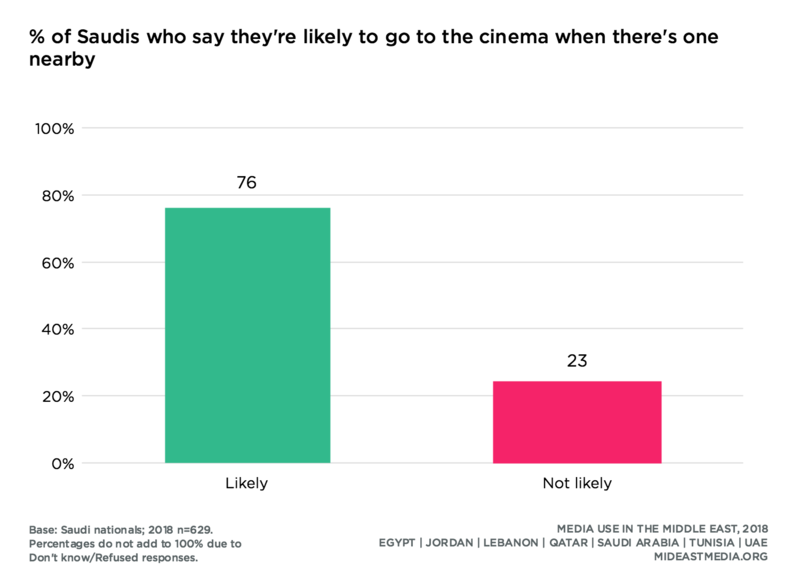 Lebanese nationals stand out for being equivalently likely to watch films from their country, other Arab countries, and the U.S. Egyptians are far more likely to watch films from their country (nearly all do) than films from any other locale. Films from the U.S. are more popular among younger nationals. Nationals 18 to 24 years old are twice as likely as those 45 and older to watch films from the U.S.
Nationals who identify as culturally progressive are more likely than their conservative counterparts to watch films from the U.S. and Europe. Men are more likely than women to watch films from the U.S., while more women than men watch films from their own country (U.S.: 45% men vs. 30% women; their own country: 62% women vs. 58% men). University-educated nationals are five times as likely as those with a primary education or less to watch U.S. films (54% university or more, 40%, secondary, 24% intermediate, 8% primary or less). 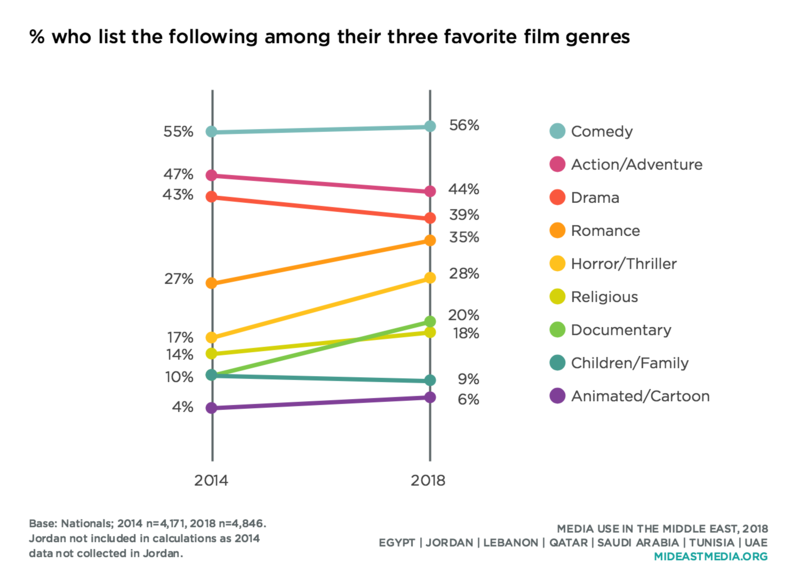 Comedy, action/adventure, and drama have been genres most-cited by Arab nationals as among their favorites in each of the entertainment-observant iterations of this study (2014, 2016, 2018), with little variation over time (cite the following as among their three favorite genres—comedy: 55% in 2014, 58% in 2016, 56% in 2018; action/adventure: 47%, 48%, 44%; drama: 43%, 45%, 39%). But there has been increased interest in other film genres as of 2018, including romance, horror/thriller, documentaries, and religious genres (romance: 27% in 2014 vs. 35% in 2018; horror/thriller: 17% vs. 28%; documentary: 10% vs. 20%; religious: 14% vs. 18%). While film genre preferences are generally similar across countries, there are some notable variations. More Saudis than other nationals list comedy as among their three favorite genres, and majorities of Qataris and Emiratis list action/adventure and horror/thriller as favorite genres. 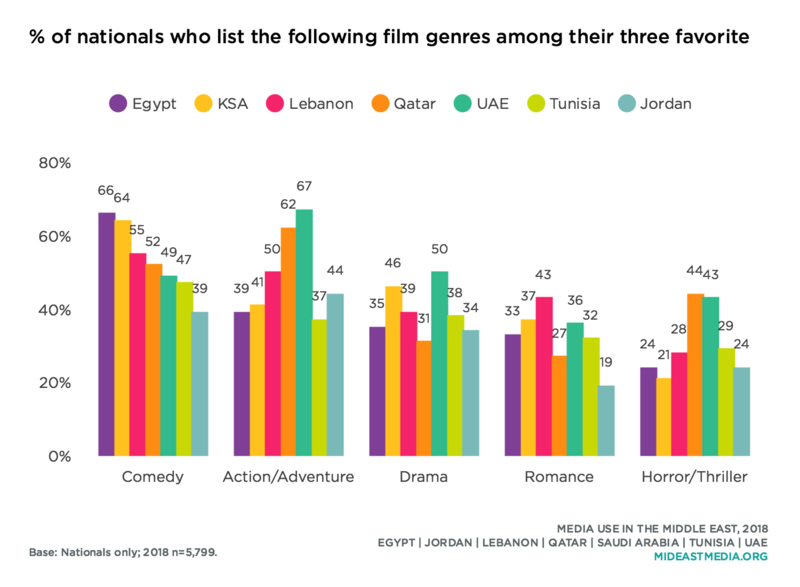 Lebanese nationals are the most likely to enjoy romance films, while Jordanians are the least likely to cite the romance genre as a favorite. Egyptians stand out as being twice as likely as nationals from other countries to name Arab classic as a favorite film genre, and the percentage increased significantly from 2016 to 2018. Both genders frequently cite comedy among their preferred genres, though men are more likely than women to say action/adventure and horror/thriller are among favorites, while women are more partial than men to drama and romance films (action/adventure: 62% men vs. 27% women; horror/thriller: 38% men vs. 17% women; drama: 46% women vs. 31% men; romance: 44% women vs. 21% men). Age also plays a role in some film preferences. The youngest nationals are more likely than those in older cohorts to name action/adventure, romance, and horror/thriller among their favorite film genres, while older nationals are more likely to prefer documentary, religious, and Arab classic films (action/adventure: 57% 18-34 vs. 27% 45+; romance: 40% 18-24 vs. 20% 45+; horror/thriller: 39% 18-24 vs. 13% 45+; documentary: 25% 45+ vs. 16% 18-24; religious: 31% 45+ vs. 10% 18-24; Arab classic: 33% 45+ vs. 14% 18-24). While many nationals watch films online, there was only a moderate increase between 2016 and 2018 in the proportion who have paid money to do so. The largest increase was in Saudi Arabia, where the number who have paid to access films online rose from 4% in 2016 to 15% in 2018. There were also moderate increases in Qatar and Tunisia (Qatar: 6% in 2016 vs. 10% in 2016; Tunisia: 1% vs. 5%). 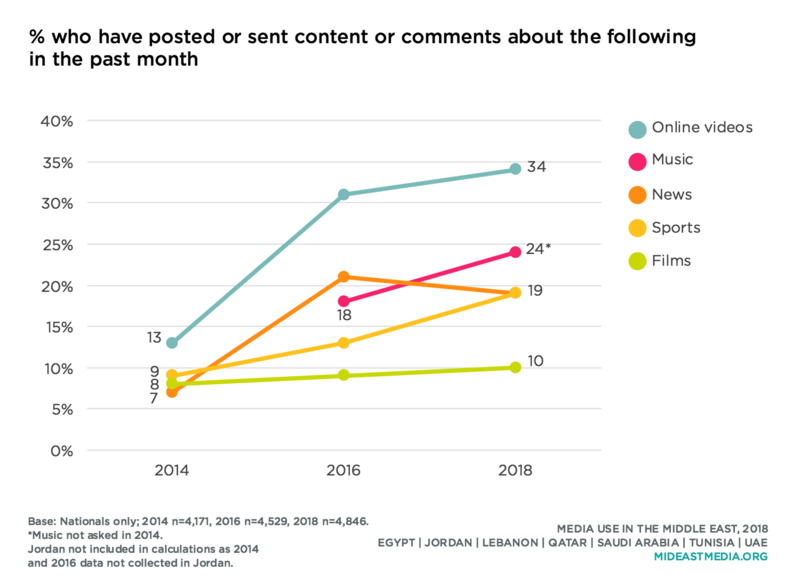 While Arab nationals are generally not willing to pay for much online content, they are more likely to express willingness to pay for access to films and sports online than other content (9% sports, 8% film, 6% music, 4% video games, 3% TV shows, 3% news). The youngest age group—18-24 year-olds—is nearly four times as likely to have paid to access films online in the previous year, compared to those 45 and older, but still only a small proportion of this group paid (11% 18-24 year-olds, 7% 24-35 year-olds, 6% 35-44 year-olds 3% 45+year-olds). There has been an increase over time in the number of nationals who have sent, shared, or posted content or comments online on various topics. But of those topics, films are among the least likely to be the subjects of online posts. Nationals are much more likely to share about online videos generally, and also about music, news, and sports.